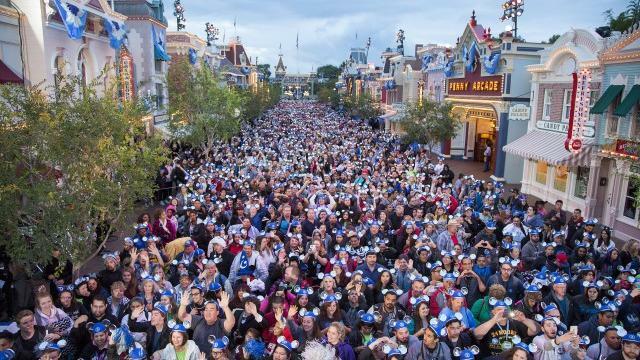 Disneyland’s 60th: What are you waiting for? The Happiest Place on Earth kicked off its 60th anniversary Diamond Celebration on Memorial Day weekend, with a 24-hour party, a crystal-and-sapphire shimmer just about everywhere—and lines, lines, lines. What’s new at Disneyland, and how long should you wait to experience it? Sunset gives you the scoop. The Happiest Place on Earth kicked off its 60th anniversary Diamond Celebration on Memorial Day weekend, with a 24-hour party, a crystal-and-sapphire shimmer just about everywhere—and lines, lines, lines. What’s new at Disneyland, and how long should you wait to experience it? We’ve got the scoop. Newly bedazzled with more than 100,000 blue-glass crystals on its roof and dozens of diamond-like jewels on its turrets, Sleeping Beauty Castle will star as the backdrop for thousands of family photos this year. Wait time: No waiting if you approach from one of the castle sides. Just pull out your phone and Instagram away. One of the three classic Disneyland rides to get a revamp, the 1959 Matterhorn is now roamed by an Abominable Snowman on steroids. There’s also an enhanced sound system (for amplified yeti grunts) and, as your bobsled ascends at the start of the ride, a brief glimpse of animation—similar to Big Thunder Mountain’s recent update. The tracks remain the same on both sides of the Matterhorn—watch our two Media Preview Day videos to experience the Tomorrowland track‘s fast, rough ride and compare it to the Fantasyland track‘s longer, smoother ride. And the bobsleds are still the 2012 edition—with single seats, so no more snuggling for warmth on the snowcapped ride. And still no FastPass. Wait time: Worth 20–25 minutes in line (achievable during a parade). When the fright fest debuted in 1969, one of its resident ghosts only lasted a day before it was kicked out for not being up to snuff: the Hatbox Ghost, whose leering head was intended to disappear from his shoulders and reappear in the hatbox dangling from his hand. The time and technology were right for bringing this ghoul back, says the Haunted Mansion’s Imagineering producer, Jeff Shaver-Moskowitz: “What better way to honor our Imagineers who worked on the original attraction—and honor fans of the Hatbox Ghost—than to bring him back and really be able to do that effect in a way that everyone has been waiting 45 years to see.” Watch our quick Media Preview Day video to see the new Audio-Animatronic in action in his new spot, in pitch black just before the Haunted Mansion’s graveyard. Wait time: Worth 15–20 minutes in line (achievable during Fantasmic). Or grab a FastPass. New magic will allow Wendy, John, and Michael to soar alongside Peter and Tinker Bell, who’s being promoted to a bigger role on the classic Fantasyland ride. Main Street, U.S.A., is once again electrified by a nightly parade, with an eye-popping 1.5 million LEDs pulsing to pop interpretations of classic and newer Disney and Disney•Pixar tunes, including a remix of “When Can I See You Again?” from Wreck-It Ralph. Tinker Bell and her Pixie Hollow fairies lead off the 15-minute parade, which features characters and songs from Monsters Inc., Cars, The Little Mermaid, Finding Nemo, Toy Story, and a number of princess movies (including the ubiquitous Frozen). Floats are interspersed with dancers both festooned with and twirling lights, and the parade is closed out by Goofy, Donald Duck, and Minnie atop balls of light with Mickey towering high above as The Sorcerer’s Apprentice. Wait time: Worth 15 minutes for a third- or fourth-row spot—thankfully, the floats are all tall. See for yourself in this Paint the Night highlight reel. • As she has for decades, Tinker Bell still starts the fireworks show—but now she cuts loose from the straight old cable and is able to soar and zoom between the castle and the Matterhorn.• The Matterhorn erupts in flames and lava to transform into Finding Nemo‘s Mount Wannahockaloogie.• Crisscrossing bursts of fireworks create curtains of diamonds above the castle.• Snow (very realistic snow) floats down on Main Street during the mandatory Frozen segment of the show. Wait time: With multiple animation-viewing locations and pyrotechnics overhead, there’s no need to wait to watch. But don’t miss it!